AMC brought the entire cast of Fear the Walking Dead to the 2019 WonderCon in Anaheim. That included the surprise return of Rubén Blades and the appearance of series newbie Austin Amelio who’s crossing over from The Walking Dead. 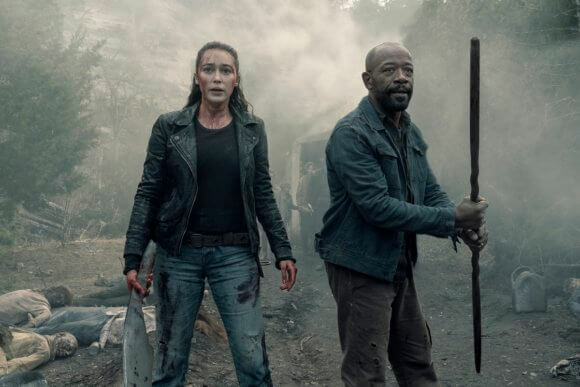 Of the original Fear cast, only Colman Domingo and Alycia Debnam-Carey remain. Alycia Debnam-Carey was paired with Maggie Grace for roundtable interviews about season five of Fear the Walking Dead. The trailer showed fans a few hints about where the new season is headed, but unfortunately the series isn’t returning to AMC’s primetime lineup until June 2, 2019. What is Alicia up to this season with her signature weapon? Alycia Debnam-Carey: “I know. She levels up. That’s what happens. She’s been through so much loss in season four. She’s now completely on her own. She has no family remaining and that’s had a huge effect on her. It’s something that hasn’t been resolved, something she’s struggling to work through and how to move forward. […] She becomes like a protector for the group, because I think that’s the only thing she knows how to do that she thinks that’s where she’ll put all her energy. Probably because she’s terrified of losing again but also getting too close to people. Is there going to be an Alicia-centric episode this season? Where will Alicia draw her strength from without her mother? Alycia Debnam-Carey: “Drugs, mostly. (Laughing) I think her mother’s message is really ringing clear, that no one’s gone until they’re gone. This thing is her just trying to build a community like her mother had, trying to fulfill her mother’s wish. That’s still striking a chord with her, but she’s really struggling to ground that and I think it’s Morgan as a character who’s trying to bring her out, to see that there is more and that it can be about reaching out to other people and that there is hope beyond just keeping people physically safe. What’s going on with Grace this season? She was reluctant to connect but we saw connections starting to happen. Can you talk about what was happening in the scene where you’re being knocked around and dragged? Maggie Grace: “Well, I can because there was this dragging machine where my hands were bound, my legs were bound to the bar. And as the dolly moves, it drags me with it. Basically, I was just bound to the dolly. I don’t know what I ever did to Mike [Satrazemis]. It was a cool shot that Michael came up with that I was happy to do. What’s a bigger peril, walkers or the elements?